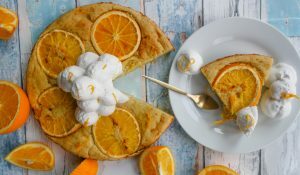 Before you start on making this recipe I must warn you that this Orange Cake is Sugar-Free and only contains the natural sugar of the oranges and banana (fructose). 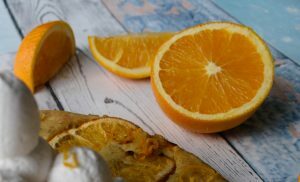 Since I love having leftover cakes for breakfast I decided to come up with a recipe that will be sugar-free so that I can start my day with the right energy, the one that goes up steadily until lunch time. Nothing makes me feel grumpier than feeling hungry less than 2 hours after having had breakfast! The risk when baking a sugar-free cake is to end up with a cake which tastes like nothing at all! And that is not a risk I am willing to take I am afraid 😊 especially in the morning. Fresh fruit juices or purees are the best way to add sweetness to cakes without using the actual sugar. 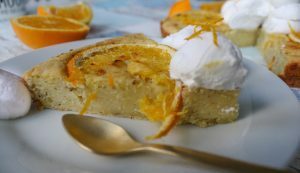 I personally love to use apple puree or orange juice as I did in this recipe. 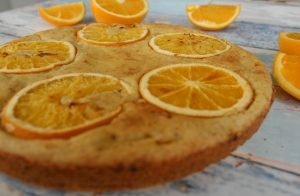 This Vegan Orange Cake is extra moist and dense which will keep you full and satisfied for the entire morning. It is sugar-free as well as gluten-free & dairy-free so that we can all enjoy a slice (or 2) of it! 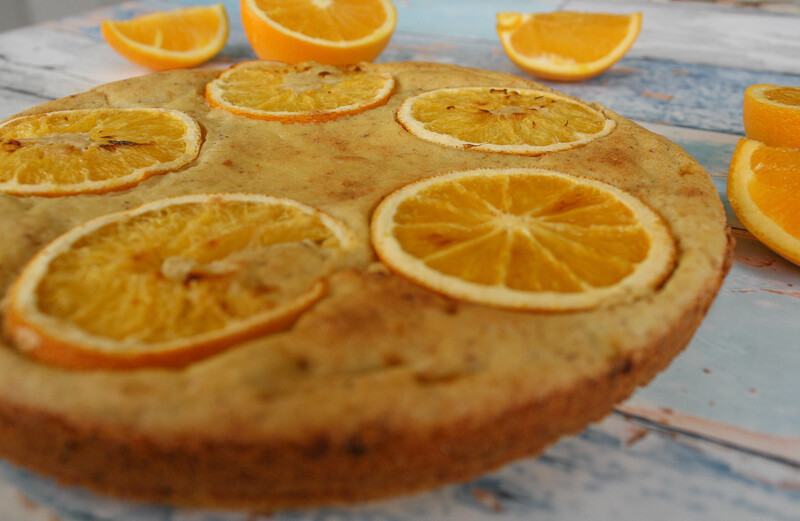 I hope you try and like this Sugar-Free Orange Cake, if so let me know! Share on Pinterest and tag a photo on Instagram #mimies_delicacies so that I can see your lovely creations as well as helping me reach more of you lovely people. Merci my friends! 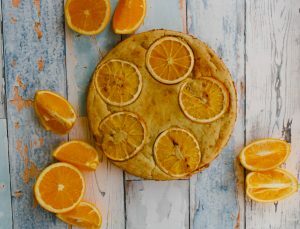 Sugar-Free, Dairy-Free and Gluten-Free Orange Cake! 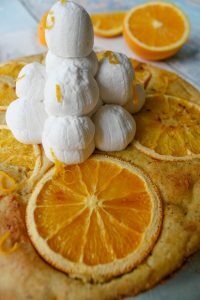 Make yourself a delicious breakfast with a slice of this dense and sugar-free Orange Cake, it will keep you satisfied until lunch time! Place the oven rack in the middle of the oven and preheat to 180°C. Grease your pan. Cover the ground flaxseeds with 3 tbsp. of water and leave on the side for 10 minutes. Cut 5 thin slices of oranges and position at the bottom of your pan. Next in a different bowl, place all the wet ingredients and combine thoroughly. Pour the wet ingredients into the dry ingredients and whisk until no lumps remain. 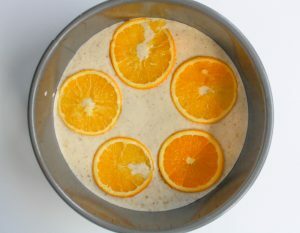 Pour the batter into your pan over the sliced oranges and place in the oven for 40 minutes or until golden brown.